The Greek letters may seem like a difficult roadblock,, but you can master them quickly by starting with the letters that remind you of English letters, and then gradually adding more letters. 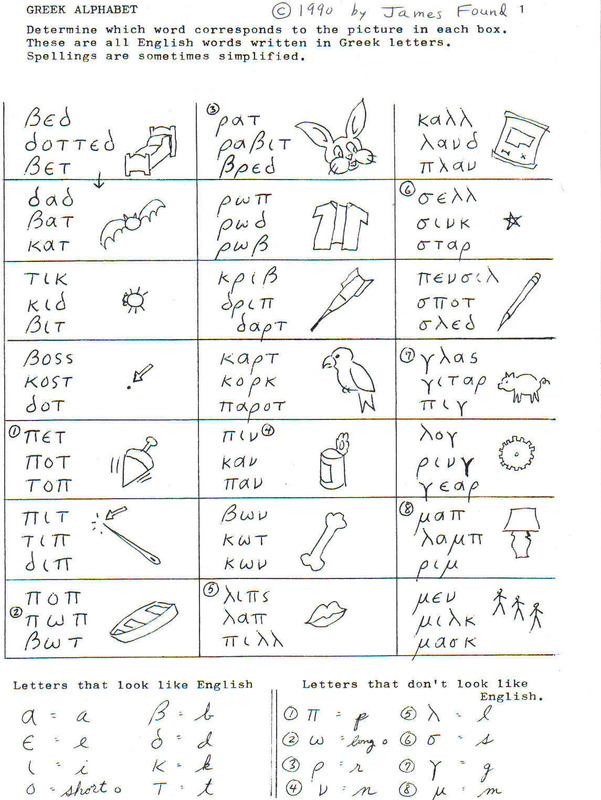 In the chart below, there are English words spelled out in Greek letters, but as you will see these Greek letters look a lot like English letters,, and are pronounced the same . Start at the upper left in the picture boxes below. When new letters are introduced, there is a circled number that is explained at the bottom right of the sheet. A few comments on the letters: the Greek letter for “i” does not have a dot on it. The small letter “b” looks a lot of the English capital B. The letter that looks like an “s” is only used at the end of words — otherwise the “s” sound is written as a circle with a short line coming off the top. Now try reading some Bible verses. Pronounce the Greek when you come to it, and imagine what English word it stands for. You can check yourself by looking up the Bible verse. To continue with this same gradual approach, consider buying the book Basic Greek in 30 Minutes a Day,by the author of this website, Jim Found. It is stocked in many Christian bookstores, and can also be bought at online bookstores. See Review. The publisher is Bethany House, now part of Baker Books. The subtitle is New Testament Greek Workbook for Laymen. By the time you have finished all 290 pages,you would be able to read the Greek words noted in reference books. 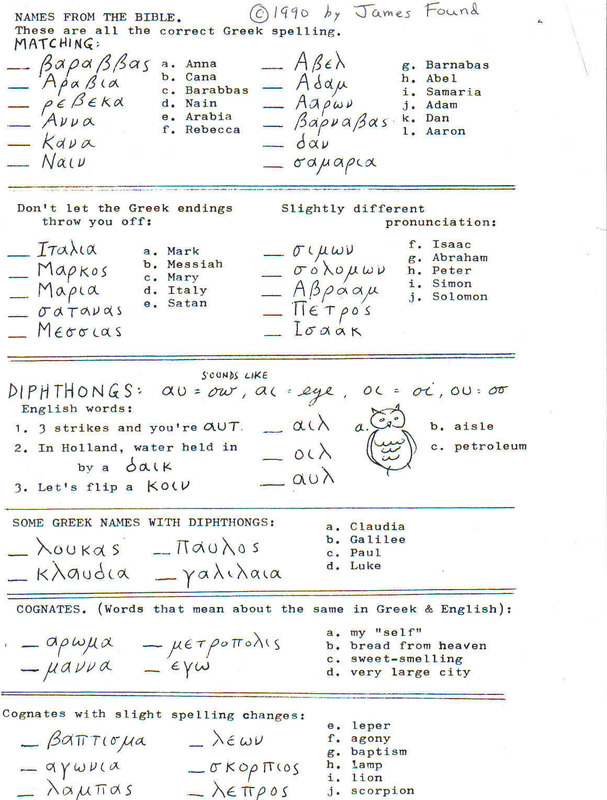 You would have an overview of Greek grammar. You would have a large vocabulary of Greek words. You would be well situated to take a college-level Greek course. ► In section one, you are gradually introduced to all the Greek letters. You read them in common words,and see them used in Bible verses. ► Section two introduces you to the endings. These enable you to determine, for example, whether you are looking at the subject that does the action in a sentence, or the object that receives the action in a sentence. ► Section four is made up completely of Bible word studies. Your concept of the meaning of biblical words will be enriched when you see how they are built up and how they are used as nouns, verbs, and adjectives. Some of the words presented are: apostle, holy, righteous, and confession. ► In section five more details are given about grammar, and many tables are presented that assist you in finding the fine-points of meaning of a given word. You will sense your growing skill in Greek because an entire Bible chapter (1 John 1) is written at the end of each section, and each time it appears you are able to read more of it.